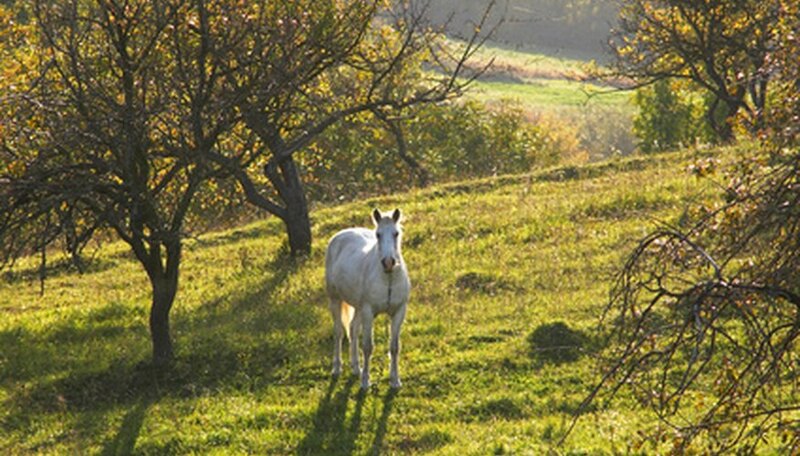 Shade trees are beneficial to horses because they provide blockage from the sun for the pasture; however, because many trees are considered toxic to horses, choosing the right tree is essential to keeping your horses safe. Choose trees that will thrive in your environmental conditions like sun exposure and soil type as well as trees that are safe and non-toxic to your horses. American beech trees (Fagus grandifolia) are deciduous, safe, non-toxic shade trees for horses that display dense, green leaves that turn gold/brown during the autumn season. Thriving in full sunlight to partial shade, American beeches prefer moist, well-drained soil and attract wildlife like birds due to their production of small nuts. With a slow growth rate, this shade tree grows to a height of 50 to 80 feet and a width of 40 to 60 feet; plant in USDA Hardiness Zones 3 to 9, as directed by the NC State University Cooperative Extension Service. Black spruce trees (Picea mariana) are safe, non-poisonous shade trees for horses. This evergreen displays blue-green needles and small purple cones that become a brown color during the autumn season. Thriving in full sunlight, black spruce prefers moist, well-drained soil and is sensitive to high heat. Black spruce trees grow to a height of 30 to 40 feet and a width of 10 feet; grow in USDA Hardiness Zones 2 to 5, as recommended by the NC State University Cooperative Extension Service. Northern catalpas (Catalpa speciosa) are shade trees well-suited for growth near horses; Northern catalpas are safe and non-toxic to horses. This narrow deciduous tree displays green leaves that become brown to yellow-green during the fall season as well as an abundance of showy white flowers with orange and purple markings. Thriving in full sun to partial shade, Northern catalpas prefer moist, well-drained soil but tolerate either dry or wet sites. With a moderate/fast growth rate, this shade tree grows to a height of 40 to 70 feet with a width of 20 to 40 feet; plant in USDA Hardiness Zones 4 to 8, according to the NC State University Cooperative Extension Service. Green ash trees (Fraxinus pennsylvanica) are non-toxic to horses and provide ample shade, according to the Ontario Ministry of Agriculture Food and Rural Affairs. Green ashes are deciduous shade trees that grow in a pyramidal shape, displaying green leaves that become yellow during the autumn season. Thriving in full sunlight, ash trees tolerate both wet and dry soil, making them a safe, versatile choice for a variety of landscapes. Green ash tolerates drought and wind. With a rapid growth rate, this shade tree reaches a height of 50 to 60 feet and a width of 25 to 30 feet; plant green ash trees in USDA Hardiness Zones 3 to 9, as directed by the NC State University Cooperative Extension Service.